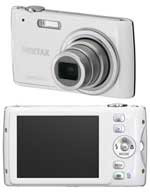 The Pentax Optio P70 can capture 12-megapixel images and 720p video at 15fps, with a 4x zoom, 28mm lens, and a 2.7", 230,000 LCD for $199.95. The camera will be available in silver, white or red. Aperture settings range from f/2.6 to f/5.8, which is pretty fast for a point-and-shoot lens. It also has a wide ISO range, from 64 to 6400, though ISO 3200 and 6400 are available only at 5-megapixel resolution. Pentax is also talking up their Vertical Snap Mode, which "allows for easy mobile phone style image capture", which means you can take photos using the four-way pad and OK button on the camera's rear, if you want, instead of hitting the shutter. Other handy features include smile and blink detection, image recovery to save accidentally deleted photos, and 90 decorative frames to digitally showcase your pictures. The P70 weighs a svelte 4.4 oz (125g), and measures 3.8"wide by 2.1" high and 0.8” deep (9.7 x 5.3 x 2.0 cm).